This trainee darkling is making his stand early in life - much to the derision of his school chums. What do THEY know, eh? Dressing in black PVC and covering yourself in makeup is SO going to make you popular. You really are different from the others. No, honestly, you really are. You're sensitive and interesting and you've got something to say that matters. Honest. LOL i would beat the crap out of all those kids(except the goth!)! the kid holding up his middle finger, his legs look really DEFORMED!! We were the ones that got into pubs, gigs and clubs whilst all the "normal kids" were getting pissed up on cheap cider in the park once they begged an adult to buy it for them. Anyway, this pint sized Harbinger of Doom needs a few tweaks to his look for sure. If he's the only gothlet at school he'll probably face constant bullying and end up looking like he's been punched in both eyes without the application of eyeliner anyway. Bless. Those windows look awfully familiar. I believe this goth being ridiculed, at not just any school, but at CalArts. Probably during the summer school program which I attended. If you can't be yourself at Art Camp, where can you? This poor kid is doing it wrong. Please do not wear trash bags. Even if you're flat broke, there are other ways to get clothes, I promise! I'm pretty sure that's a girl. And those kids are her friends. They're posing for the picture, the kid flipping the bird is wearing a Slipknot shirt, two of them are holding up her...train, and there's a lot of black going on. I'm with you except for the "girl" part. 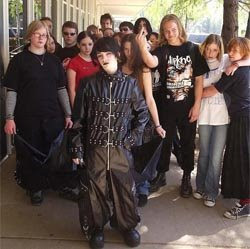 Androgeny is a high art among young goths. Hmmm... I'm with you except for the boy part. I used to live in San Francisco, where one MUST develop a preternatural appreciation for the subtle differences in the sexes (or else only date in Berkley). holy crap! is that a JUMPSUIT?! Oh...god. Ok, this is kind of hard to admit but I slept with the boy giving the middle finger. I am actually not joking. His name is Peter. He is Welsh. It was 2007. We met over the summer, I was living in London, we chatted online for the better part of a year, he came to visit and many cheap beers in Camden later... yeah. Not proud. To be fair, he's not so much a goth as a wannabe metalhead, and is actually a very sweet boy, just very confused.